Explanations to the book "Unified Physics"
from the book "Unified Physics". The PDF-Version of this page (however without the animated pictures) can be seen here. Figure 1. The paradigm idea as a covering of a background picture with “puzzle elements”. That vision can be imagined as a background picture of our scientific description of the World. The old scientific paradigm was originally based on the core vision of the World by English physicist Isaac Newton. His Dynamics has formed the center of our modern knowledge in 2nd half of the 17th century. One hundred years later another English physicist, James Clark Maxwell, has developed his Electromagnetic Theory. It replaced for three millennia the Newton's Dynamics as the central piece of our science at the time. At the beginning of 20th century, a German physicist, Albert Einstein has discovered his famous Theory of Relativity. Nevertheless, it remained only a peripheral knowledge till our times. Also at the beginning of 20th century, many European physicists, (first of all Niels Bohr, Ervin Schrödinger, and Max Planck) have developed the Quantum Theory of Atoms. However, also this fascinating theory remained only a peripheral knowledge about the Microcosmos. Max Planck, the actual father of the quantized energy idea, has also formulated his Planck Scale combining the gravitational constant G, the vacuum-speed of light c0, and his own quantum of action (Planck constant h) into some abstract units of length, time, and mass. Unfortunately, the values of G, c0, and h as used by Planck belong to three different states of matter. Thus, the original Planck Scale cannot have any practical meaning. It remains a peripheral curiosity of the Old-Paradigm science. In spite of that absurdity, the unrealistic units of the Planck Scale has been used till today in many scientific theories. One of such absurd applications of the Planck Scale is the “Big-Bang” idea (actually not a theory at all), which assume the space and time being created at the “Big-Bang” event, but using the Planck's length and time to define the Universe expansion during and immediately after the event itself. It remained also a peripheral scientific idea. During the second half of the 20th century, the Elementary Particle Physics was the hope carrier of the modern science. However, after several decades without results, there is clear now, the study direction to smaller and smaller particles was a wrong, peripheral idea too. There are many other disciplines of the 20th -century science based on the Old Paradigm, first of all the Life Sciences. However, none of them is able to unify the split “puzzles” and cover the Old-Paradigm vision of our World. A new vision of our Universe and our role in it is necessary today. The New-Paradigm idea is based on the ancient knowledge that some unifying Oneness, a Universal Unity has to be positioned at the very core of our knowledge. The central piece of the New-Paradigm vision is the Universal Unity, the Oneness, the Universal Creative Potential to create everything else. This Universal Unity creates its two basic components of our new description of the entire reality. First of them is the Unified Family of all physical quantities we have ever introduced into our science; all being created directly from the Universal Unity; all physical quantities are related to each other. 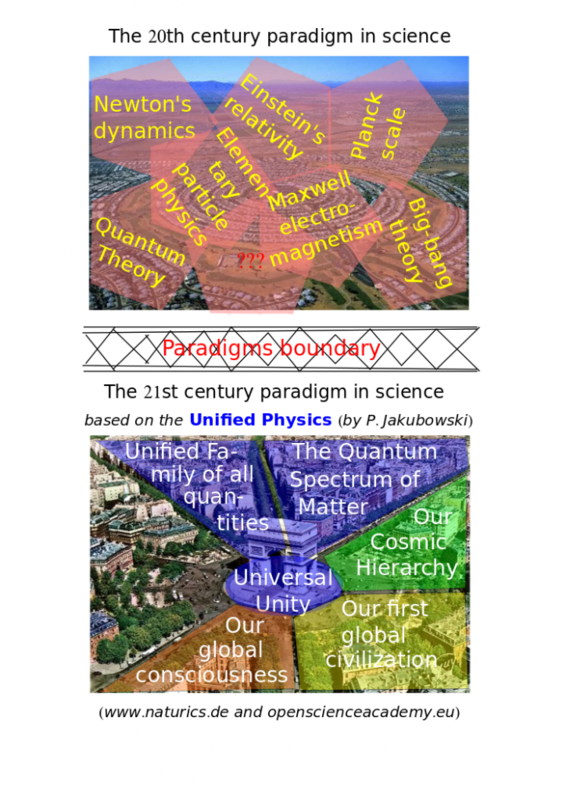 The second basic component of the New- Paradigm vision is the Quantum Spectrum of all Matter-Spirit Quanta; a “library” of all possible Quanta. They all are also directly created from the Universal Unity. The entire Universe, from atoms to super-clusters of galaxies, is quantized. First important application of the two basic components of the New-Paradigm knowledge to the Universe's structure and organization is the Cosmic Hierarchy of our Solar System. It extends from the Sun to the presently observable boundary of the Universe. The most important result of the Cosmic-Hierarchy application is the new understanding of the origin and the exact beginning of our First Global Civilization inhabiting the entire Earth since 1989. The most important aim of the New-Paradigm science is the explanation of the physical nature of our individual and global consciousness as a product of the brains and super-brains of all living as well as all already passed creatures. Many other exciting discoveries by means of the Unified Physics will surely follow soon. That is the meaning of Figure 1 from my book “Unified Physics”. Let's meet each other again to the second part of Easy Naturics.